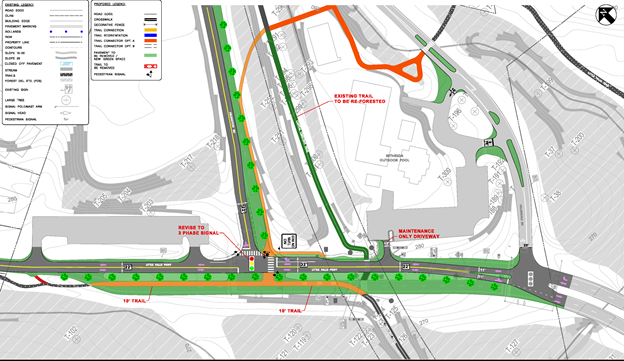 Montgomery Parks staff is seeking public feedback on the three alternate concept plans to improve the Capital Cresent Trail crossing at Little Falls Parkway. The Capital Crescent Trail (CCT) was created in the 1990s as part of one of the most successful of the Rails-to-Trails conversion efforts. It has become the most popular shared-use trail in Montgomery County with thousands of users each day. Little Falls Parkway (LFP) was constructed in the early 1960s to provide the community with greater access to the Little Falls Stream Valley Park. At that time, the train crossings of LFP were relatively infrequent and safely controlled. However, trails do not function like railroads, and the existing uncontrolled, multi-lane crossing has presented continual safety issues between the trail users and drivers on the Parkway. 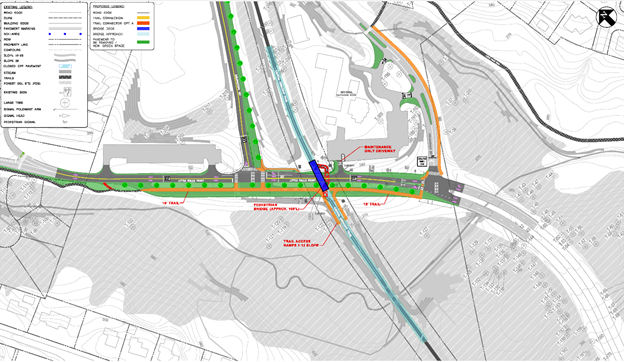 The purpose of the project is to develop a permanent safer crossing solution for CCT users at Little Falls Parkway. The outcome of this project will be the selection of the preferred alternative with community input, and the development of 30% level design approved by the Montgomery County Planning Board. 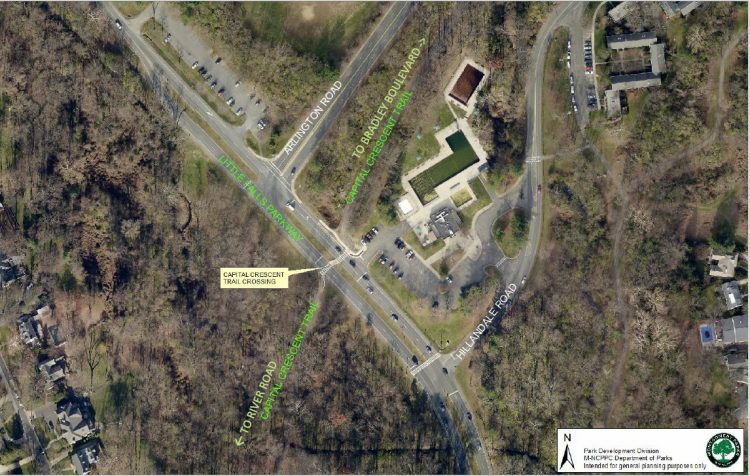 The project will also incorporate traffic calming measures along Little Falls Parkway, Arlington Road, Hillandale Road, and the Bethesda Pool entrances, as well as trail connections from Little Falls Trail and the adjacent neighborhood. The Capital Crescent Trail (CCT) follows a former railroad line (the Georgetown Branch of the B&O Railroad) and extends for approximately 11 miles from Silver Spring in Montgomery County to Georgetown in Washington, D.C. In January 2017, Parks initiated a Vision Zero (Montgomery County Vision Zero Information: https://www.montgomerycountymd.gov/visionzero/) response to increasing trail user safety. This interim design consisted of installing high-visibility flexible bollards to create a temporary “road diet” along Little Falls Parkway (between Hillandale and Arlington roads) that reduced the roadway from four lanes to two inside-only lanes at the crossing. The interim improvements also included additional safety signage at the CCT crossing and an educational outreach program by Park Police. While there were some initial concerns raised by the driving community about these changes, Parks has responded to concerns by incorporating minor adjustments of the interim conditions. These adjustments reduced redundant signage, reduced glare from reflections, and opened the southbound travel lanes sooner. Parks believes driver behavior has successfully adjusted to the interim conditions, and accidents at the crossing have been dramatically reduced. The project goal is to develop a permanent safer crossing for all trail users while minimizing vehicle delay, construction/operations costs, and environmental impacts. Parks has retained Sabra Wang & Associates to conduct this study and develop alternatives. Typical general improvements common to all alternatives include lighting, assessment of Bethesda Pool driveway, environmental, assessment/improvement of adjacent sidewalk and trail connections, and assessment of road diet and traffic calming feasibility on adjacent roadways. Please click here to download a summary table of the three alternatives. Making the current interim road diet permanent: Re-configuration of Little Falls Parkway into a two-lane (one lane in each direction) road with an uncontrolled speed table crossing. Slight (+7 seconds) increase in average travel time for motorists compared to pre-road diet conditions. No change in trail user wait times. 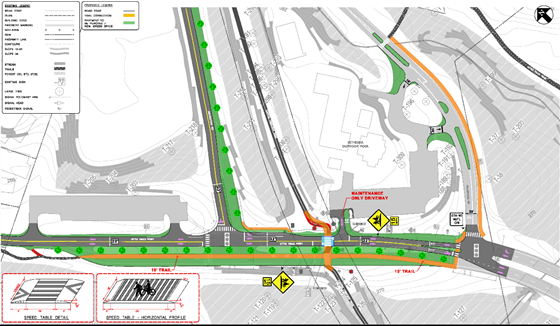 Re-orientation of the Capital Crescent Trail to the Arlington Road intersection, with a controlled signalized crossinga and a permanent road diet. Additional (+13 seconds) increase in average travel time for motorists compared to pre-road diet conditions. Increase in trail user wait times (+30 seconds). Install pedestrian overpass bridge over Little Falls Parkway. Subscribe to receive important updates about Capital Crescent Trail Crossing at Little Falls Parkway Review. Subscribe to updates from the Montgomery County Department of Parks, and you'll get emails announcing new topics and the outcome of existing topics.